Italian painter, born at Ascona in the Ticino, he was a solitary and eccentric figure on the post-Caravaggio scene. Like so many from his part of the world, he left the Lombard valleys to find work in Rome where he arrived in about 1615. Rather than following in the footsteps of his father and brother, both famous plaster-decorators, Serodine tried instead to make a name for himself as a painter. His temperament was diametrically opposed to the classical school and it was not long before he found himself marginalized. He only obtained a handful of commissions (including The Charity of St Lawrence in the abbey at Casamari). 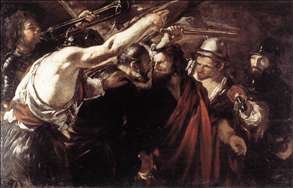 These all illustrate his harsh, dramatic style, which was even more direct and brutal than Caravaggio s. He worked with rapid brushstrokes, as if wielding a saber, far removed from the polished grace of the Emilian school. Serodine was deeply influenced by Caravaggio and especially by Caravaggio s Dutch follower Terbrugghen with whose works Serodine s were often confused; it is, however, difficult to see how this happened, since Terbrugghen was certainly back in Utrecht by 1616. Serodine died young and only produced a few works in his short career. Among them, three canvases on religious subjects that he sent back to the parish church in Ascona were outstanding, as was his Portrait of the Father (Lugano, Museo Civico). Serodine was one of the most personal of the Caravaggesque painters. Since he died so young all his works date from the 1620s and there are only about fifteen known (four in Ascona); after his death he was completely forgotten and was only rediscovered in the 1950s. 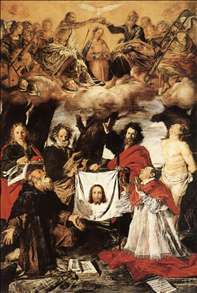 See more details about "Coronation of the Virgin with Saints"
See more details about "Parting of Sts Peter and Paul Led to Martyrdom"